The violin is one of the most tender and noble instruments in the world, so it needs to be taken care of accordingly. This means proper strings, constant plays, and, of course, a suitable case for traveling with it everywhere you want. 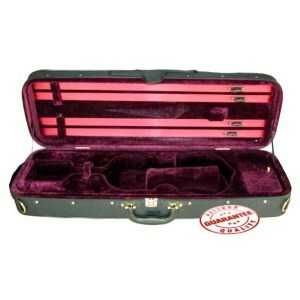 So, if you’re looking for the best violin case to place your treasure, we might be able to help you. After going through numerous online reviews ourselves, we have come to the conclusion that one of the best items on the market is the Baker Street BK-4020. It features a sturdy plywood shell for improved strength and a lightweight design, comes with a luggage grade nylon zipper, and offers enough interior space to stack all your essentials. However, is the Baker Street BK-4020 is not available for sale, we may also suggest you taking a look at the SKB 1SKB244 violin case because it is similar in design, cost, and efficiency. This violin case is made using sturdy plywood, which gives the shell impressive durability while also keeping it light and easy to transport. The interior is padded with a velour material, soft to touch and delicate enough not to harm the surface of the instrument. Additional compartments are added to fit the various accessories a player needs. The key-closed latch under the handle makes sure no intruders access the case. Customers have complained that it’s difficult to fit a shoulder rest inside, even in the largest compartment. This roomy alternative will provide your violin with all the safety measures required. 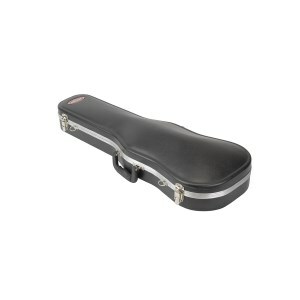 Designed to hold a wide range of violin shapes, this case offers the protection you would expect. The interior features various storage compartments that come in different sizes, where you can keep your valuable accessories. The hardware of this model is reinforced with backplates, which considerably improves the overall durability, making sure this item has a long lifespan and adequately protects your instrument. Apparently a standard issue -- neither this case nor other models are able to fit a shoulder rest inside. You’ll get the protection you require for your violin if you try this alternative from SKB. This double violin case is roomy enough to fit all the essential components of your set while still being lightweight, due to the materials used. The rosin compartment features a padded interior, which will protect the delicate surface of the instrument. 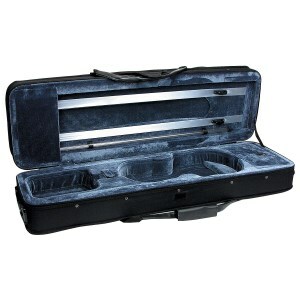 The size of this case allows you to fit two regular sized violins comfortably, so it’s an excellent idea for when you’re traveling with several band members to a concert venue. Due to the size and weight of this item, it might be slightly uncomfortable to carry it without the help of a vehicle. 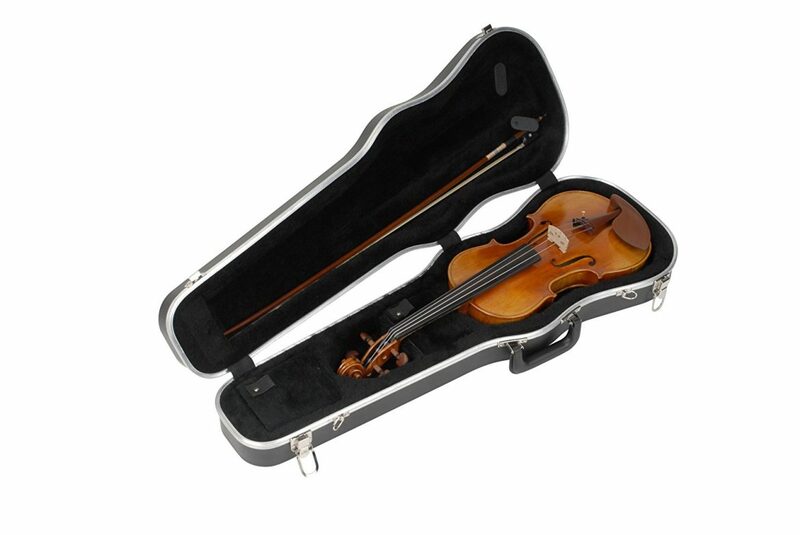 Travel safely with this violin case option that fits two models simultaneously, saving space. There are numerous violin cases available on the market, so finding the right choice for you and your violin is sometimes difficult. If you’re in a hurry and don’t have the time to go through the selection process yourself, we might suggest you some product options. 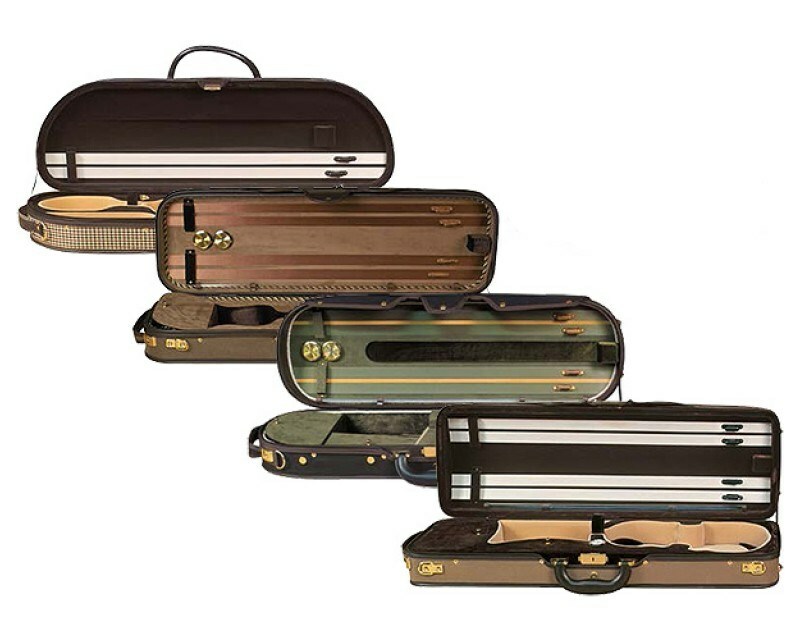 The most popular violin cases on the market are showcased below. 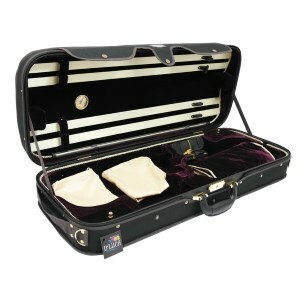 This luxury violin case is perfect for even the most virtuous violin players and professionals in the industry. It features a sturdy plywood shell to provide a maximum lightweight design, as well as increased strength to protect the violin from crashes, drops or accidents. The velour-like interior features a two-tone color design for an elegant touch, while still providing full suspension. Some of the carrying and transportation features include an adjustable shoulder strap with a non-slip pad for easy transportation on your shoulder, as well as an under handle latch with a key to protect your violin from steals. The item provides a roomy interior with enough storage deposit for your violin or viola, as well as other required accessories like hygrometer, clear string tube, bow holders or thermometer. In addition, it also comes with an elegant silk bag for your violin to protect it from dust, water or stains. This product is elegant and luxurious. This item comes in three different sizes to perfectly match the size of your violin or viola. The case is designed to safely hold plenty of sizes and models of violins while fully securing them and protecting them on the inside. It comes with a D-string for a strap so you can wear it on your shoulders. The interior storage compartment is roomy and helps you safely store your violin and all required accessories. It even comes with a special interior pocket to hold two bows. The exterior shell is reinforced with backplates to ensure maximum protection against weather, shocks or accidents. This way you can now your violin remains intact and safe, no matter the exterior conditions. The velvet-like interior is not only elegant but also provides increased protection for all your violin accessories while keeping them tight and in place. This violin case is perfect for beginners who want a more protective case than an elegant and refined one made of luxurious materials. 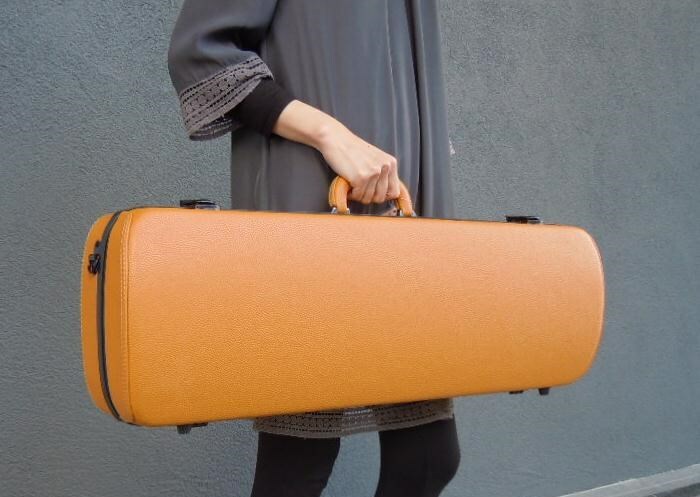 If you plan on traveling with more than one violin with you at a time, it is best to appeal to a professional, dual-size violin case. This D’Luca item is the perfect choice for you as it can comfortably fit and protect two full-size violins, along with all necessary accessories. The product is made of the most resistant and luxurious materials, providing enhanced protection against shock and outside weather conditions, while still offering a spacious and luxurious interior with special compartments to fit all required accessories. It even comes with a full-zipped pocket to store your music sheets so you can always play your part without mistake. The convenient shoulder straps help you carry the item in style without any back or shoulder pains. The padded interior provides extra safeness and a spacious interior with special compartments for your string tube, hygrometer, and up to four bow holders. The high-quality velvet material on the inside is luxurious and worth spending extra. The oblong shape of a violin case is probably the most popular option amongst students and newbies because it provides enhanced protection for the violin, and all the necessary additional instruments and accessories. This item is no exception and features a hard ABS exterior shell for improved protection against dust, snow, rain, shocks, and accidents. In other words, the ABS case is rough enough for fully protecting your violin and features a fully waterproof shell. The interior lining is made of qualitative plush to add even more protection to your violin and additional accessories. 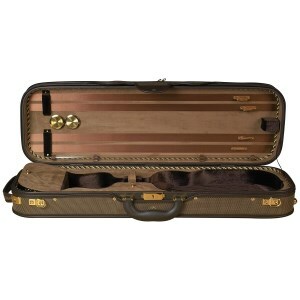 This is a standard violin case with extra room for two bow holders but no additional pockets. However, the oblong design offers more storage space so you can place your music sheets and spring tubes. The manufacturer praises the German design of these cases and claims the items were made to withstand up to 200 pounds of pure pressure without breaking or cracking, hence the increased protection. This oblong case comes in three different sizes to match most of the types and sizes of violins and violas available for purchase on the market. It is made of a durable yet lightweight material to ensure maximum coverage and protection against weather condition and shocks, but it is still lightweight enough to be easily carried in hand or on the shoulders. It features a full-length zippered pocket for music sheets so you can practice your part anytime you want, without worrying about forgetting the notes. The double shoulder strap is perfect for convenient transportation without hurting your back or shoulders. The oblong design counts for enhanced protection of your violin on all sides while also offering a comfortable interior, with plenty of free space to store your musical instrument and the required accessories. The violet velvet interior is of superior quality, offering a luxurious and sophisticated touch while contributing to providing enhanced protection against shocks for your violin. The product is sold in three different color options, one to match your personality and your playing style. All colors feature luxurious velvet touches on the interior and are made of heavy-duty materials on the outside to provide maximum protection against all weather conditions and shocks. The construction features a condensed molded foam with plywood, making this case extremely durable and reliable for transportation, even on the plane or in other means of public transportation. However, it is still lightweight enough to be easily carried around on your shoulders or in your hand. On the inside, you can find one end-large pocket to store the violin accessories and even your music sheets. It also comes with four bow holders, while the oblong design provides enough room for your violin to sit comfortably. The luxurious velvet interior has become a trademark for the D’Luca company, and this product makes no exception. 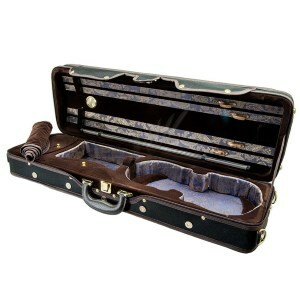 The exceptional quality of the black velvet interior will provide a luxurious overall look to this violin case. 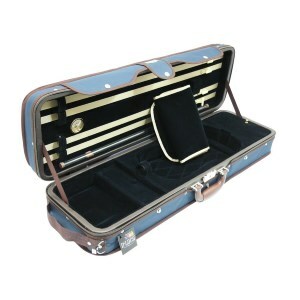 This top-quality violin case is made of a super-strong fiberglass hard shell and features a comfortable backpack design. The straps provided are adjustable to provide maximum comfort while carrying, without hurting your back or shoulders in the long term. The high-quality velvet lining on the interior provides super quality, a touch of elegance, as well as enhanced protection against shocks or harmful weather conditions. The top of the case also features a Crossrock leather handle and grab handle for convenient carrying when you don’t want to put the case on your shoulders. The item is sold in four different color choices – black, blue, red, and white, each aiming to provide maximum comfort on the inside and maximum durability and protection on the outside. The product weighs approximately 3 kg and is made to ensure a perfect fit for a wide array of violins. However, to make sure you purchased the right fit, always measure your instrument prior to your buying and compare your violin’s dimensions with the ones of the case provided by the manufacturer. This luxurious item is made of waterproof faux leather of top quality and features an oblong design for maximum comfort, durability, and protection. The rough construction is still lightweight and will last you many years from now on, while adequately protecting your violin and all accessories. The sturdy construction on the outside features a soft and luxurious velvet lining on the inside, as well as a neck restraint, and a tailpiece protector to keep your violin steady and ensure a tight fit. The interior also comes with two large-sized storage compartments for your shoulder rest and rosin, while the exterior design features two shoulder straps for easy and convenient transportation. This beautiful violin case is everything you want if you want to carry your instrument in style while also keeping it 100% safe and sound. Thanks to the sturdy and waterproof construction on the outside, the case will be able to absorb excess moisture and shocks, maintaining your violin dry and ready to play. This full-size case is perfect for protecting your violin while offering enough extra storage deposit for all items and even music sheets. The item is made of a strong, durable, yet lightweight material with outstanding protection capabilities to make sure your violin stays in one piece and is ready to play at any time. The oblong design provides more storage deposit place. The interior features a shaped compartment for your violin, as well as four bow holders, a hygrometer, a full-length music sheet pocket on the top with reliable zippers, as well as other special compartments for storing other essentials. Thanks to the suspension cushions your violin will remain centered to minimize the impact on the instrument and provide little to no damage even in cases of shock. The interior is lined with top-quality and luxurious velvet with a touch of elegance and prestige. 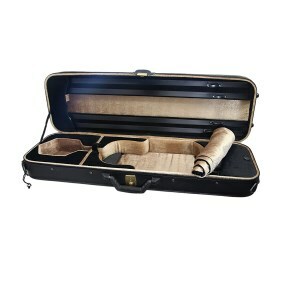 Besides, the case comes with a matching blanket to safely store your precious violin. Just like its name suggests, this product was specifically designed to meet the needs of even the pickiest violin professionals. The item is made of waterproof 1680-den ballistic nylon fabric with a featured built-in rainproof jacket to minimize damage in case of harsh weather conditions. The interior features a luxurious and qualitative velvet lining for extra comfort and protection, and it also comes with a special built-in sheet music pocket on rear. You will also have room for up to 4 bow clips. 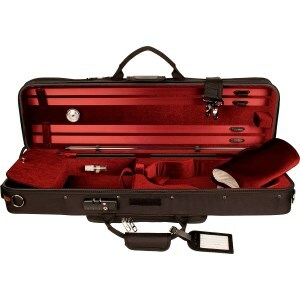 The case is protected by a TSA lock to help you store your violin safely, away from any theft or damage attempts. 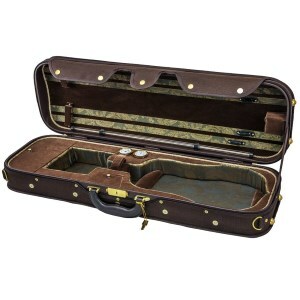 This violin case also comes with a trustworthy handle and one large shoulder strap for easy and convenient transportation. The rugged yet lightweight design makes this case the perfect item to store your musical gear and even travel by plane, bus or any other means of public transportation. The item is made of a rigid foam construction and features wooden frame reinforcements for extra durability and added protection, while also keeping your case lightweight and easy to transport. The padded and molded velvet interior provides a neck support for your violin, as well as a Velcro strap to fit a large number of violins with different sizes and styles. The rough and stable fit will keep your violin safe and away from exterior shocks. The interior also features plenty of accessory compartments, as well as two different bow holders. The exterior comes with adjustable shoulder straps for convenient transportation without hurting your arms, shoulders or back. 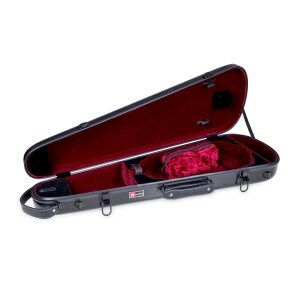 This full case is perfect for transporting your violin on long distances and through different types of vehicles, so make sure to purchase one if you plan on traveling alongside your instrument. Last but not least, the item is very convenient in terms of price, and most of the customers appreciated the rugged exterior and the beautiful blue shade of velvet on the interior. The item comes in five different color options, so we’re sure you will find the right fit and match for your own violin. 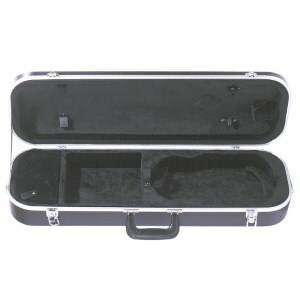 This is a full 4/4 violin case, so make sure it will fit the size of your own instrument. The product provides extra protection both on the outside and on the inside, while remaining lightweight, and convenient to travel with. This case is made of a canvas cloth material on the outside featuring a solid wood construction for enhanced protection on the edges. This way you will know sure your violin is safe and easy to deposit, no matter where you travel. On the inside, it features numerous and large storage compartments, so everything has its own place to sit comfortably. The interior features a beautiful and luxurious printed velvet that adds style while also providing the perfect protection for the violin, and all its accessories. It also comes with four bow holders included. Finding the right product starts with a thorough research on the Internet, so make sure to read all about the reviews of violin cases and see what other customers have to say about certain products. It is important to know everything about a product before purchasing it, so make sure to also check our comprehensive shopping guide to find the best violin case for sale. Here is what you should bear in mind. It goes without saying that the best lightweight violin case should perfectly fit the size of your violin. In order to make sure you chose the right size, measure your violin previous to the purchase, and compare the dimensions of your item with the ones of the case you want to buy. Keep in mind that some cases provide adjustable sizes, suitable for a wide array of sizes and styles of both violins and violas. However, if you want the perfect match, look for an item specifically designed for the meets of your own musical instrument. When it comes to shape, there are a few that will remain popular, depending what you are looking for. As a general rule, the most common shapes of violin cases are the shaped or “contoured” ones, and the oblongs or rectangular. Each shape comes with its own perks and downsides, so it is up to you to find the perfect fit for your needs. For instance, the shaped cases come in the classic shape of a violin are more lightweight and, so, preferred mainly by students and young professionals. They are also more convenient in terms of price. However, they often come with little to no extra compartments to store your accessories, and some of them may only be able to fit a narrow array of violin types and sizes. On the other hand, the oblong or rectangular cases are mainly preferred by those who have studied and played the violin for a long time and know what to look for. Although less compact, these are more reliable and come with numerous interior and exterior storage deposit pockets to fit all your accessories, including spare strings, shoulder rest, rosin, bow, and even practice music sheets. Moreover, the best double violin cases come in the oblong design, with plenty of spare room for storing everything you need. So make sure to go through some violin case reviews online to see what other customers have to say about a certain item, and then decide upon the right size, shape, and fit your own instrument. Probably the most important feature to look for in a good violin case is the material used to manufacture the product. This is the one ensuring the item’s safety and protection, so don’t try to opt for cheaper items as they usually are less qualitative. There are numerous types of materials used for making violin cases, including compact foam, wood, leather and faux leather, carbon fiber, or hard plastic. Again, each material comes with its own perks and downsides. For instance, wood cases are amongst the most reliable and most durable, but also come with a rugged and rigid design which is less flexible and hard to carry around. Real leather and faux leather are similar, but they are more flexible, although still heavy and hard to handle, especially if you’re opting for an oblong style. Hard plastic like ABS is one of the most affordable materials on the market and will provide the right type of protection you are looking for. It is resistant to shocks and pressure, but once the plastic is cracked, you’re going to need to replace the entire case. A carbon fiber option is probably the best violin case for air travel and land travels across the globe. Carbon fiber is extremely lightweight, durable, and strong, so it will provide you 100% protection against shocks or breaks, while also being easy and convenient to carry around. Last but not least, you must think about the features the interior of the case can provide. Many of the high-end cases come with a luxurious and gorgeous velvet interior lining in royal and vibrant colors. But velvet doesn’t only look pretty, but will also ensure your violin and other accessories stay in place and are fully covered in case of breaks or shocks. As for other features you should look for, we suggest opting for products with numerous interior storage deposit places like special pockets and room for additional strings. Some of the good violin case brands products also come with a fully-zipped pocket for your music sheets, which is more than welcome when you want to practice and learn your part by ear. How to make a violin case? Most of the violins are delivered with their own case, but we suggest opting for a professional one, especially if you plan on traveling from one to city to another or even to different countries. As we previously mentioned, the outside of a violin can be made of leather, hard plastic, wood or carbon fiber. The construction of a sturdy case requires extreme precision, as well as the use of top-quality additional accessories to protect your violin from harsh weather conditions or shocks. Thus, we don’t recommend this as a DIY project, at least not without the minimum knowledge of how violin cases work, and what they should stand for. 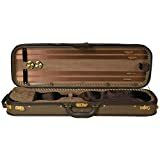 What type of violin case is the best? We already covered this issue in the buying guide above, so make sure to read that section thoroughly for more details. Choosing the right type of case depends on your expectations, desires, and budget. We do suggest skipping the shaped cases and opt for a rectangular shape if you want to protect your violin, and still have enough room for all required accessories. In terms of material, if you want to invest in a long-lasting and highly protective case, we would definitely recommend carbon fiber and leather or faux leather. Don’t forget to choose a waterproof coating also to avoid damage from rain or snow. Is a hard shell violin case better than the rest? This depends on what you need from such a case. Obviously, a hard shell case is more reliable and stronger, but it is also more rigid and hard to handle. 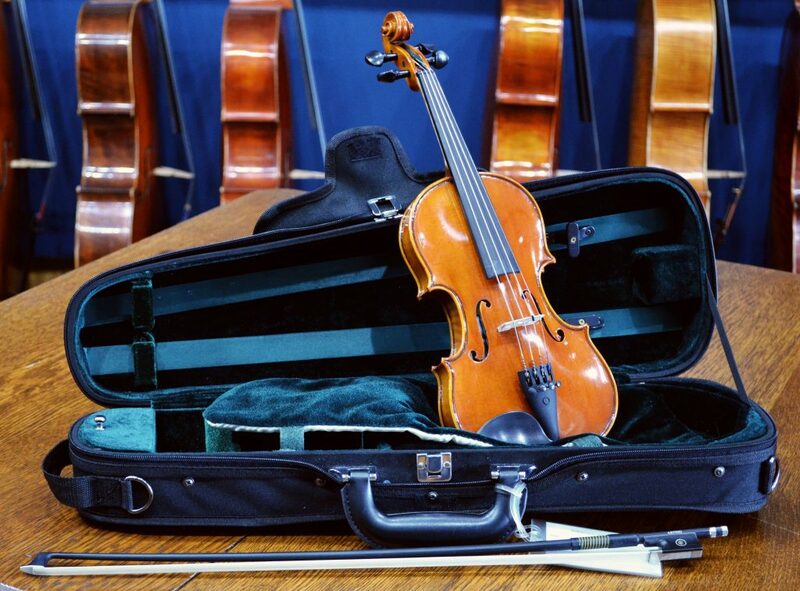 If you are usually carrying your violin on long distances on a daily basis, we wouldn’t suggest opting for a hard shell as it may cause you back or shoulder problems in the long term. You should also avoid this type of case if you’re petite, skinny or have back problems as it takes a few muscles to handle the case, even if you plan on carrying it on your shoulders.